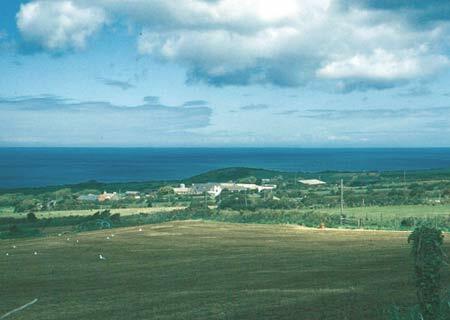 This is a relatively small area of modern Pembrokeshire comprising the eastern section of the Pen Caer/Strumble Head peninsula (except the coastal strip and Ciliau Moor Common) located entirely within the parish of Llanwnda. During the medieval period the area formed part of the medieval Cantref Pebidiog, which was conterminous with the later Hundred of Dewsland created in 1536. It was held directly by the Bishops of St David’s, having represented the core of the bishopric from 1082 when it was granted (or confirmed) by Rhys ap Tewdwr, king of pre-Anglo-Norman Conquest Dyfed, to Bishop Sulien. From 1115 onwards, when Bernard was appointed Bishop of St David’s, Anglo-Norman systems of feudal government and ecclesiastical administration were introduced into Pebidiog and the Llanwnda character area occupied Villa Grandi, which was referred to as a manor in 1326 but possibly not in the formal, Anglo-Norman sense. Welsh tenurial systems appear moreover to have persisted, although variously adapted, while many feudal rights and obligations continued into the early 20th-century. The small, narrow, irregular fields in the western half of this character area are distinct from the larger, regular enclosures of the neighbouring Pen Caer character area and may be possibly medieval in origin. They are not typical of medieval, Anglo-Norman strip-fields but may have originated from fields held under native systems of Welsh tenure. The boundary between the two areas, and their enclosure systems, is represented by a stream, which is crossed by Pont Eglwys, the findspot of a cross-carved Early Christian Monument. It has been suggested that the monument was a boundary stone, and it may therefore be that this boundary between the two areas is a very long-standing division. This area may in fact represent a former ecclesiastical estate based on the parish church of Llanwnda which lies at its centre. The church is almost certainly early medieval in origin, with seven 7th century to 11th century Early Christian Monuments suggesting monastic status; an importance that persisted into the post-Conquest period when it was one of the most important prebends of the Bishops of St David’s. It too is nuclear to a pattern of dispersed, irregular strips of land, which, as noted by Terry James, are probably derived from the early enclosure of land held under Welsh tenure. Llanwnda itself does not appear to have been the focus for a medieval township and it is not mentioned in the Black Book of St Davids of 1326. In fact only one holding, Ciliau Fawr, can be tentatively identified from the Black Book, when one carucate of land there was held ‘by the Law of Wales’. The holdings of Ciliau Fawr, Crincoed and Carngowil formed part of the Bishop of St David’s estate and were mapped in 1815. Most unusually two maps of Ciliau Fawr exist that help explain its landscape evolution. The first shows the holding as it was considered to have been some 40 years before 1815. Dispersed field strips, possibly enclosed or unenclosed, predominate, with a few regular fields. By 1815 the holding was consolidated into small regular fields. Elsewhere different systems of agriculture appear to have been employed, for instance, in the eastern half of the character area a pattern of larger fields can be seen, some of them clearly representing the late enclosure of marginal land, probably during the18th century and 19th century. Other fields, such as those around the nucleated farmstead of Pen-rhiw, may be nearly as late in origin – Pen-rhiw is not mentioned until 1603 and was a minor gentry-house in 1699. By the tithe survey of 1845 the whole landscape was similar to that of today. Llanwnda is an undulating historic landscape character area lying between 70m and 160m on the eastern side of the Pen Caer/Strumble Head peninsula. It is an exposed tract of land, open to the prevailing westerly Atlantic winds, with no trees, except those planted close to houses for shelter and scrubby woodland in sheltered hollows. Hedges, where they exist at all are low straggling lines of bushes, gorse, bracken and brambles. It is an agricultural landscape of dispersed farms and fields. 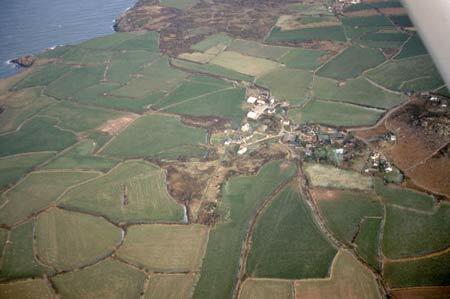 The only nucleations are the small, loose cluster of farms, houses and cottages at Llanwnda, Ciliau and Pontiago. Land-use is predominantly improved pasture, with a little arable and pockets of rough ground. Fields are chiefly small and irregular; the only exception is around Pen-rhiw Farm where slightly larger, more regular fields predominate. Field boundaries consist of stony banks, many of roughly coursed stone and earth, and dry-stone walls. Some of the boundary banks are massive. Most are in good condition. The dry-stone walls are generally not so well maintained. Stone is the principal building material for ecclesiastical, domestic and agricultural buildings. Many of the domestic buildings are cement rendered or colour washed, but the agricultural buildings are left bare. Slate, occasionally with a cement skim, is the universal roofing material. Apart from Llanwnda’s small medieval stone-built church of St Gwyndaf, set in its stonewalled enclosure, there are few pre-19th century buildings; most farmhouses, houses, cottages and agricultural buildings date to the mid-to-late 19th century. Farmhouses and cottages are mainly in the vernacular tradition, and of one or two storeys and three bays. Except for some late 19th century detached ‘villas’ flanking the moorland of Garnwnda, there are few examples of houses in the ‘polite’ Georgian tradition. A few modern detached dwellings are located at Ciliau and Pontiago, and a row of mid-to-late 20th century houses has been built to the north of Stop-and-Call. Older agricultural buildings are generally small and of just one or two ranges, and consist of barn, cow house and store/cart shed. Working farms have ranges of modern concrete, asbestos and steel agricultural buildings, but these are relatively small and are not such a distinctive element of the landscape as they are in other areas. The numerous archaeological sites of all periods indicate a settled landscape for over 5000 years. Included are finds of prehistoric and Roman date, a neolithic chambered tomb (Scheduled Ancient Monument), several possible standing stone and several possible round barrows. The importance of the area in the early medieval period is demonstrated by the collection of inscribed stones at Llanwnda Church. The boundary of Llanwnda historic landscape character area with that of its neighbour to the west is distinct and hard-edged. However, the boundary with the yet to be described area to the southwest is less distinct and is represented by a zone of change. To the north and east the coastal slope is a very distinctive and different character area from Llanwnda. 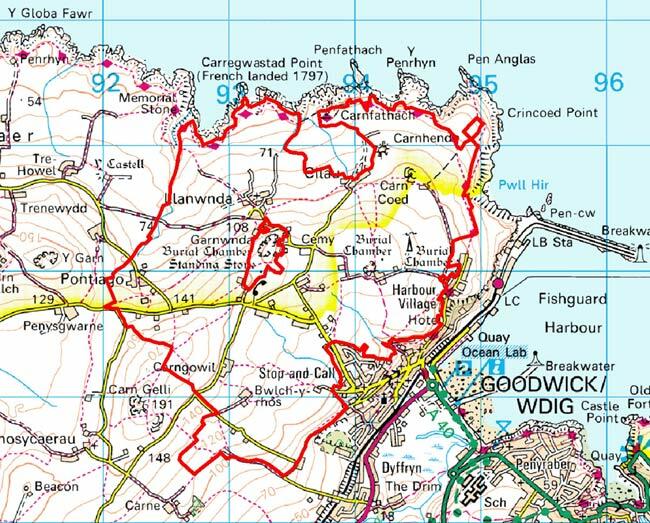 Boundary definition is equally good to the southeast against Goodwick historic landscape character area.